I've never really been one for body butters up until the past year. Don't ask me why, because I really don't know! Body lotions, butters, anything that was used for moisturising the whole body, I kinda didn't do. Naughty I know. I used to moisturise my legs once in a blue moon, but that was about it. In my eyes, my skin was soft enough and didn't need any more moisture (ah, there you go, the reason!). Even when I used to get perfume gift sets, the ones that used to come with a little lotion friend, I always ignored and just stuffed in my drawer. That quickly run out because I loved it that much, the smell, the absorbtion time, the aftermath on my skin. Everything. I went back into my drawer of many wonders and pulled out another one, this time Superdrugs Coconut Oil body cream. I remember buying this on my whim and it was really inexpensive. I'm still only half way through it, and can't say I'll be repurchasing that any time soon, the smell just doesn't do it for me guys! I then took advantage of The Body Shop's sale about a month ago, body butters were on offer for £6 down from £12. I thought this would be a good time to trial out one, so I purchased the wild cherry one. I'm a proper sweet person when it comes to smells, I love anything sweet or fruity smelling, so I couldn't wait to try this out. Hmm. Disappointed. The smell is just.. strange? It doesn't really smell of cherries to me, or any fruit for that matter. It does have a kind of sweet smell to it but I'm not impressed. I always usually trial smells in the shops before I walk away with my purchase, so I can't understand why I never with this. Typical. The one time I don't do something and I hate it. It absorbs pretty fast and does leave the skin feeling extremely soft and supple (if I keep the application regular, my dry patches do disappear). It's just a shame with the smell, I will definitely be smelling before I buy next time! Definitely going to try out some more from the Boots collection though, my ultimate favourite so far, and at £7.95 a pop, although a tiny bit on the steep side, I would repurchase, simply because I had a good experience. 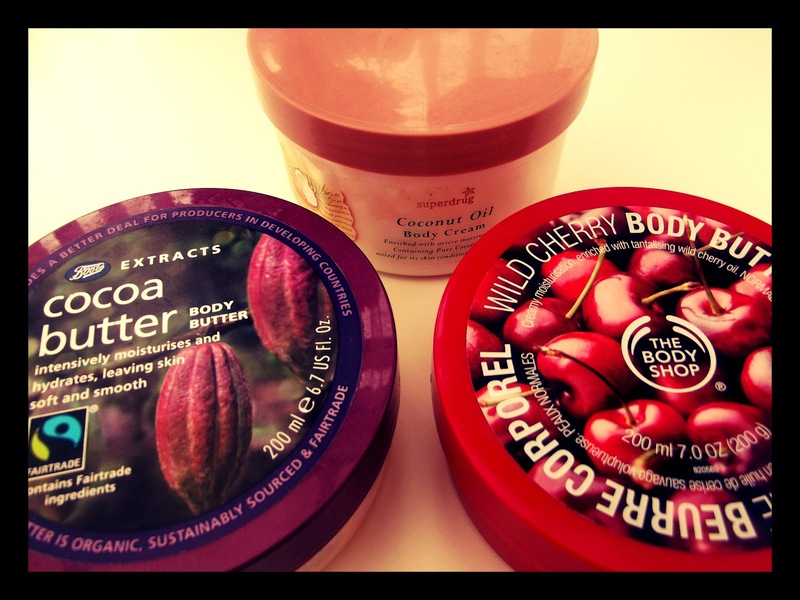 What is your favourite body butter? I am using the I love... Strawberries & milkshake one at the moment. It has lasted SO long, and it's not done yet. body butters are my favorite! I tried one from the body shop a while back but I must go pick up more! 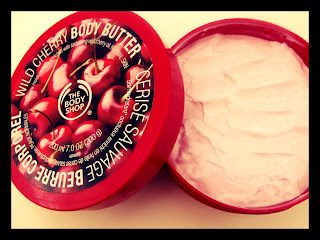 aw that's a shame about the cherry smell because TBS body butters are so many people's favorites haha! they're a really good product, too! well-made and smell great. :) My favorite used to be Cococut but I also like the Almond scent, it's so true to almonds! :) you should definitely try the smells in shop, next time you're at The Body Shop! I can't stop sniffing just to decide which one I'll splurge on one day.